What’s in a Name? Meet the Colorado Chamber of Commerce! The Colorado Chamber is Hiring! Today, it’s more important than ever that we put our best foot forward in our efforts to both protect and enhance the Colorado business climate here in our state, and so, we couldn’t be more proud to introduce our new name–and our new brand. We are officially The Colorado Chamber of Commerce, and today – and always – we will be our members’ greatest ally in positively affecting their most critical business interests . . . while continuing to ensure that the benefits reach all of Colorado. At its Annual Meeting Luncheon on October 25th, the Colorado Chamber of Commerce unveiled its rebranded identity in a short video. 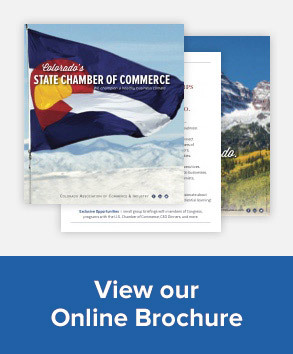 For Colorado business owners and executives and business governmental-affairs specialists, the Colorado Chamber is the leading statewide business advocacy association that relentlessly works to protect and improve the business climate and has more than five-decades of success. The Chamber is keenly aware of all issues that could affect Colorado businesses, and advocates on their behalf. The Chamber provides business leaders with unique access to government officials and to each other, which can positively affect both their companies and their careers. The Chamber’s events and programs also provide its members with unique networking opportunities and knowledge that will benefit them. The Chamber is trusted by its members for its knowledge of–and leadership on–public policy advocacy at both State and Federal Government levels. Its members know that the Chamber is committed to its mission and has a solid record of accomplishment. The unveiling of the new Colorado Chamber brand was the culmination of a year and one-half of work by its Executive Committee, senior staff, and consultants, to examine its mission and develop and implement new strategies to more effectively communicate with its members and the statewide business community. (4) Strengthen Colorado’s critical infrastructure (roads, water, telecommunications and energy). The Colorado Chamber is also the official state affiliate of the National Association of Manufacturers (NAM) and the Colorado affiliate of the U.S. Chamber of Commerce. The Denver-based advertising firm, XUMA, provided the Colorado Chamber with the creative expertise and guidance to re-brand the organization and develop and implement the social-media strategy. Kathryn Russell, Xuma Partner and Creative Director, led a multi-talented Xuma team on the Chamber’s rebranding project. The Colorado Chamber’s Tax Council has hereby submitted comments to the Colorado Department of Revenue (DOR) regarding the implementation of emergency regulations which are scheduled for a final rulemaking hearing on November 30, 2018. The regulations include: 39-26-102 (1.3); 39-26-102 (9); 39-26-103.5; 39-26-104 (1)(b)(I); 39-26-105; and 30-26-204 (2). Background: On September 11, 2018, the Department promulgated emergency rules on sales and use tax collection for in-state and out-of-state retailers which are intended to take effect on December 1, 2018. These emergency rules were in response to the U.S. Supreme Court decision in South Dakota v. Wayfair, Inc. However, they also included destination sourcing requirements for sales tax which impose a new statewide local sales tax collection requirement for both in-state and out-of-state taxpayers. 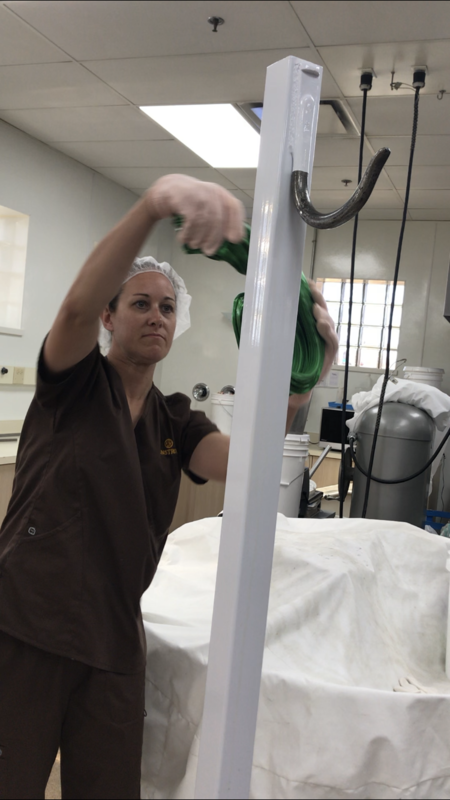 The proposed sourcing requirements have raised significant concerns from Colorado Chamber of Commerce members and those concerns are outlined in the attached comments. You may also submit comments to dor_taxrules@state.co.us by November 30, 2018 at 5:00 p.m. or bring written comments to the hearing. Please contact Loren Furman at lfurman@cochamber.com or at 303-866-9642 if you should have any questions regarding this matter. The Colorado Chamber paid a visit to several companies in Grand Junction in November including long-time Chamber members Enstrom Candies; CPCneutek; Dalby, Wendland & Co.; West Star Aviation and Reynolds Polymer. While each of these businesses represent different industries, they all stand out as leaders in innovation, and for contributing to the economic vitality of our state. 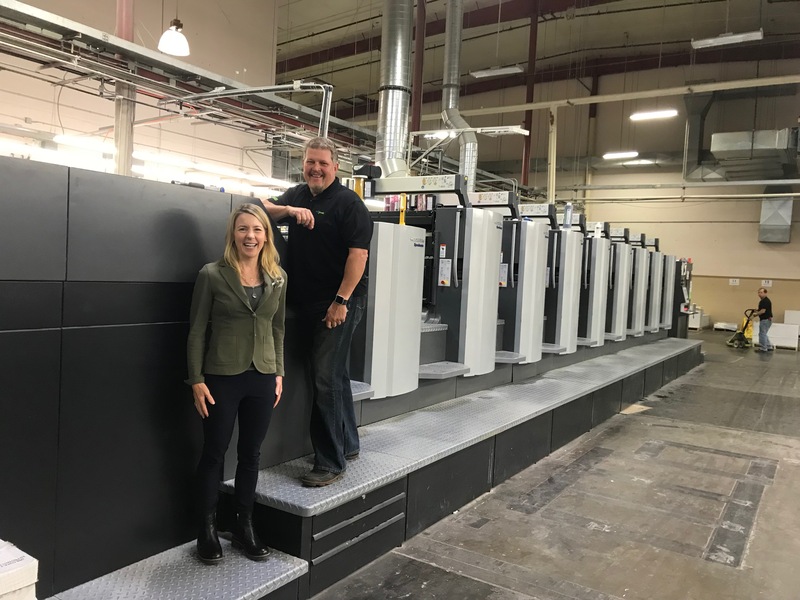 Mike Antonucci, president CPCneutek demonstrates new printing and packaging equipment that have allowed the business to expand capacity and enter into new markets. 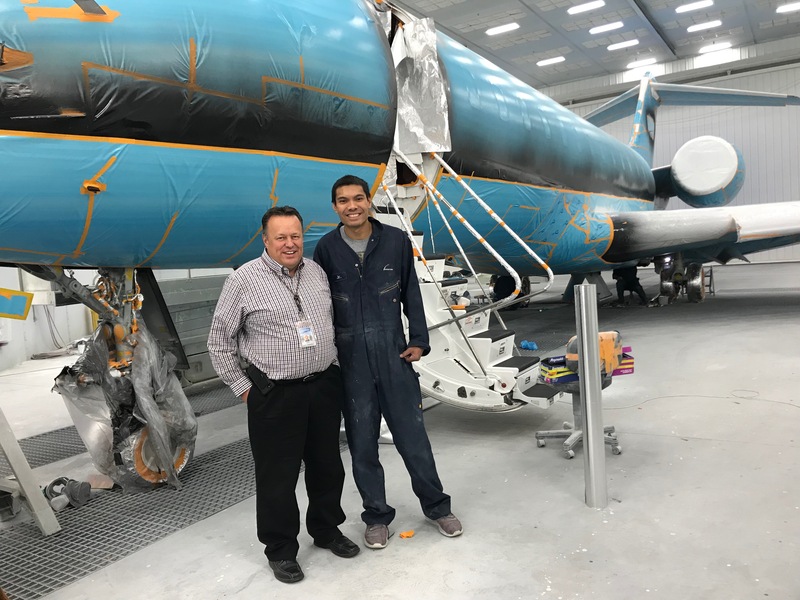 Dave Krogman, general manager of West Star Aviation stands with a colleague in front of a jet that has been prepped for specialized painting. In a visit with Doug Simons, Jr., director of operations explained how new manufacturing equipment helps Enstrom Candies stay on top of the holiday rush (orders start being placed in July for their legendary toffees), while some seasonal treats—like giant candy canes, are still prepared by hand by skilled confectioners. Whether the order calls for a five-story indoor aquarium or a transparent swimming pool suspended high above the ground between two skyscrapers, the team at Reynolds Polymer lives up to their reputation for being able to “build the impossible.” With a client list that spans the globe, Reynolds Polymer puts Colorado on the map as a source for highly specialized, custom architectural materials and design. 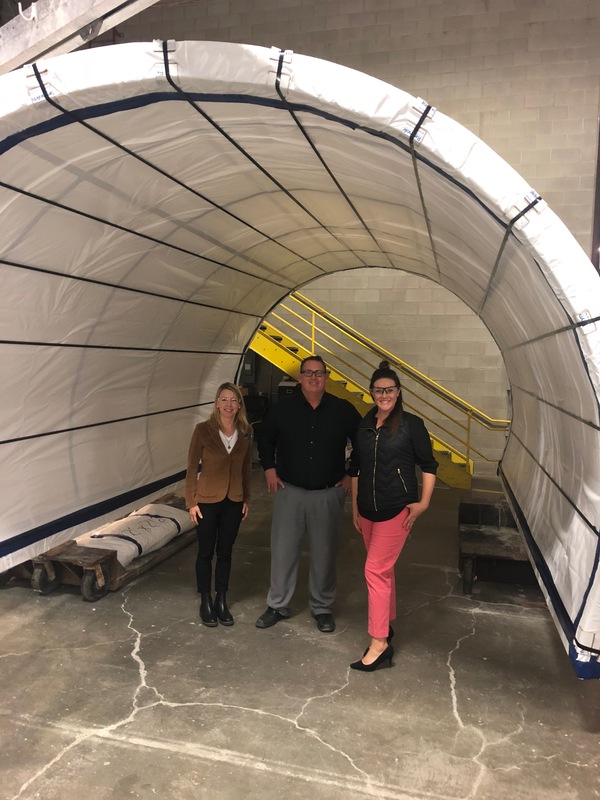 Jessica Smith, vice president of Human Resources, and Bark Baker, vice president of operations, stand with Lauren Schwartz from the Chamber inside one of the companies wrapped creations. Changing current statute regarding the regulation of vaping. Ms. Rudolph also shared updates on the TENORM (Technologically Enhanced Naturally Occurring Radioactive Material) stakeholder and rulemaking process; the Air Quality Permit Fee stakeholder process; the engagement with the City of Denver on the use of orthophosphate coating for its water pipes; and the reorganization of the Environmental Programs Office. 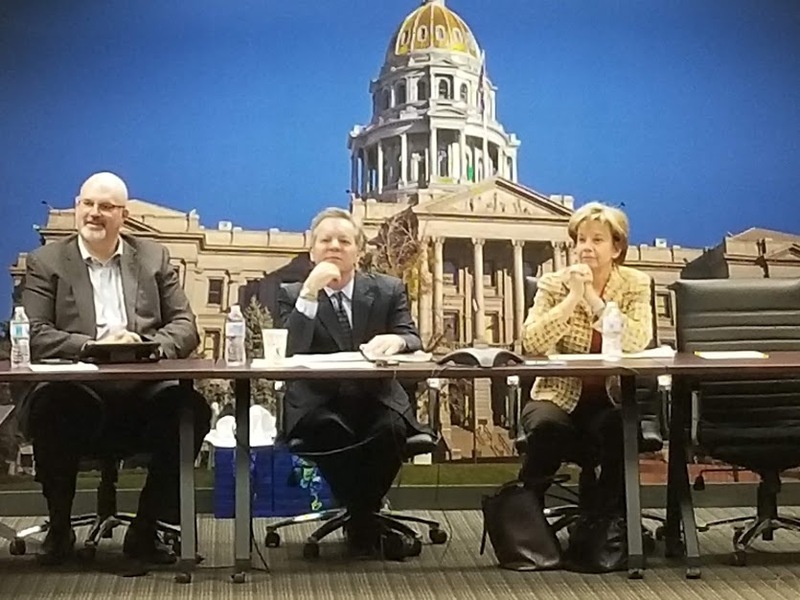 During the meeting, Bill Skewes, Colorado Chamber lobbyist, shared updates on rumored 2019 legislation as well as additional updates on the TENORM stakeholder process and the stakeholder process on House Bill 18-1400 regarding air quality permit fees which became law during the 2019 Legislative Session. 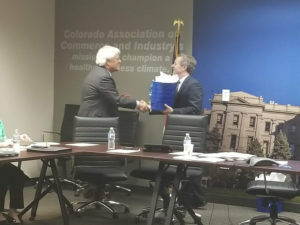 Finally, John Jacus, Chair of the E&E Council recognized Jim Spaanstra, retiring Chair of the CO Chamber’s Industrial Waste Sub-Committee and Jerry Raisch, retiring Chair of the Water Sub-Committee for their many years of support, leadership and tremendous expertise on industrial waste and water-related regulations and legislation. We are grateful to both of them for their incredible dedication in representing the sub-committees and for protecting our members’ interests on these key issues for so many years! John also recognized Gabe Racz as our new Chair of the Water Sub-Committee! We are honored that he would serve in this role as he brings exceptional expertise on water-related policy issues and will help guide our members on upcoming regulations and legislation in this area. The Colorado Chamber is seeking interested applicants for a Communications Director. This individual will have public relations, editorial and social media responsibilities with the goal of enhancing the Colorado Chamber’s communications to it’s many members, press, the overall business community, public leaders and other interested parties. Details regarding the position are provided here. REMINDER: Federal Policy Council – ONLY 3 spots left to tour the National Renewable Energy Lab (NREL) on Tuesday, 11/27! If you’re interested, please contact Leah Curtsinger by email or at (303) 866-9641 by close of business today, 11/16.